This year, we’re heading down south for the ACI Conference. Mark your calendar for July 7-11. 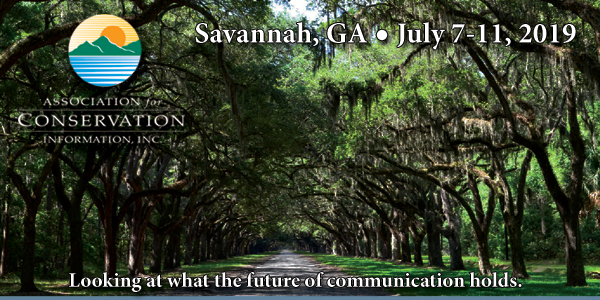 That’s when we’ll meet at the DeSoto in historic Savannah, to look at what the future of communication holds. The Georgia Department of Natural Resources and the South Carolina Department of Natural Resources are co-hosting the 2019 conference. They have some great things materializing, with topics including crisis communications, how to build media relationships, communicating about wildlife issues like CWD, relevancy campaigns, R3 and marketing from some really great speakers and industry experts. This year’s agenda will include a Magazine Roundtable. Is there a magazine-related topic you’d like to discuss? Please take a very brief (one-question!) survey and let us know. Here’s the link. What about for fun you ask? We have a riverboat cruise down the Savannah River on Sunday evening (July 7)! If that’s not enough excitement, our Wednesday field trips will be a choice of a dolphin tour, where you’ll get to see dolphins leap and play around the boat; a walking history tour of Savannah, which is rich with all kinds of history from pirates and ghosts to the Civil and Revolutionary Wars; or a visit to Wormsloe Historic Site, the oldest structure in Savannah, and go for a beautiful nature walk under a live oak tunnel. Members ($350) register via this link. Sponsors, vendors register via this link. Book your room at The DeSoto today. Call 844-257-3520, and tell them you’re with ACI; or register online, using the Group Code “ACI” to receive the group rate. Rates are $117/day + tax and resort fees. Deadline to book at this rate is June 7. Parking is valet only, $27/day. The application period for travel scholarships is now open. Also, check out the links below for information about sponsorship opportunities as well as a form letter that you can adapt and use to help persuade your supervisor to let you attend.